The Ufind OBD2 is a compact cellular 4G Cat-M1/NB-IoT tracking device that easily plugs into the OBD port of a vehicle for power. It caters for entry-level tracking and fleet management applications, without sacrificing performance or reliability. The 3D accelerometer and flash memory round out a product that is low cost but still packs a punch. 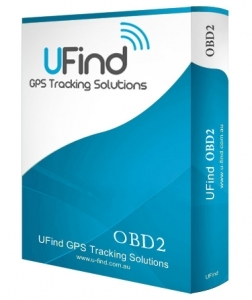 The Ufind OBD 2 simultaneously uses GPS and GLONASS satellites, providing double the number of positioning satellites than standard tracking products. The result is faster acquisition and more accurate and reliable tracking. Insert the SIM and clip the housing together. Plug into the OBD port and it’s done! The Ufind OBD 2 passes stringent automotive power “load dump” tests to ensure that it will continue to operate in the harshest electrical systems. A built-in self-resetting fuse makes installation easy and safe. The OBD 2 GPS signals are boosted by a special low-noise amplifier (LNA). This allows the Ufind OBD 2 to operate where normal units will fail to receive GPS signal. Even when designing a low-cost device Ufind is not prepared to compromise on the performance of the product. You will see the difference if you compare device performance in low signal environments. The Ufind OBD 2 can be manufactured for specific markets around the world with cellular modem modules approved by all the major networks. Having the antennas inside the housing makes for very simple and quick installation. The Ufind OBD 2 has had its antennae tuned by the top laboratories to ensure optimal performance. The 3 axis accelerometer allows the Ufind OBD 2 to detect harsh driving events (harsh acceleration, braking and cornering) and this information can be used to monitor driver behaviour and unsafe driving. It also allows the Ufind OBD 2 to go to ‘sleep’ when not moving, resulting in extremely low standby current. The Ufind OBD 2 has sufficient memory to store over 50,000 records in its flash memory. Normally the data will be sent to the server immediately but if the device is out of range then there is sufficient space to ensure that no data is lost – for many weeks of driving!